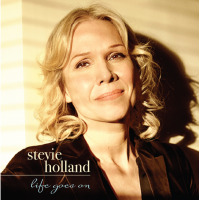 With the title derived from the opening track, "It Might As Well Be Spring," singer Stevie Holland could be considered the personified restless willow. 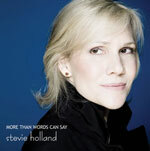 Holland has an easy vocal style that never falls prey to over-extension. She swings with a confident grace, her phrasing tasteful and accurate. These are the things that may strike the listener upon spinning Restless Willow for the first time. Skip on over to "Summertime" and hear a performance that will not blaze new trails in jazz vocals but does provide a thoroughly enjoyable listening experience. Restless Willow is a recording that demonstrates that simple entertainment is one of the most important functions of the vocal arts. This thought couples conservative performance with a standard repertoire. Stevie Holland has expertly achieved both of these. He choice of material is measured. "Summertime," "How Long has this Been Going On," "Lush Life," and "Stardust" are all dispatched with professional skill and youthful exuberance. But Holland does throw a curve. "Zoot Walks In" is the most delightful piece on the record. With music by Zoot Sims and Gerry Mulligan with words by Dave Frishberg, "Zoot Walks In" is a vocalese dream in the hand of the capable Holland. Holland has great support on this recording with the likes of percussionist Steve Kroon and saxophonist David "Fathead" Newman. Ruben Flores duets with Holland on "One Touch," filling out this fine recording with a measure of class. We should look forward to hearing more from Stevie Holland. Track Listing: 1. It Might As Well Be Spring; 2. Love Is Stronger Far Than We; 3. Summertime; 4. How Long Has This Been Going On? ; 5. One Touch; 6. Sunny Skies; 7. Lush Life; 8. Jeg Klesker Dig; 9. Here's That Rainy Day; 10. Zoot Walks In; 11. Stardust. Personnel: Stevie Holland (vocals); Sean Harkness (guitar); David "Fathead" Newman (saxophone); Kenny Washington (drums); Steve Kroon (percussion). Arranger: Gary William Friedman.